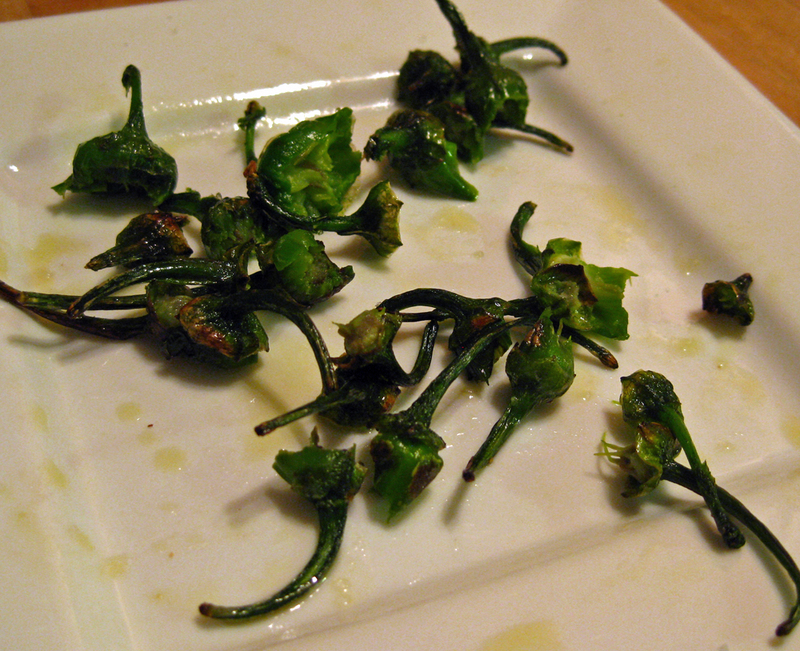 We love Jose Andres’ PBS cooking show, Made in Spain. It was a big inspiration for our trip last year to Spain. Jose and his food are amazing. Jose Andres is a product of Spain’s El Bulli, the once leader in molecular gastronomical cooking, and a master of all things Spanish nouveau. Jose’s approach to food captures the imagination and we’ve been hankering for a seat at one of his many tables since first seeing his program. Our recent trip to Washington D.C. gave us the opportunity to try Jose’s interpretation of a number of classic American dishes at the former spot of his Café Atlantico. Currently flying the banner of America Eats Tavern, the effort is a partnership of Andres’ ThinkFoodGroup and The Foundation for the National Archives. Opened on the 4th of July 2011, the effort will run a full year, closing on the 4th of July 2012. We recommend you get there sooner than later! 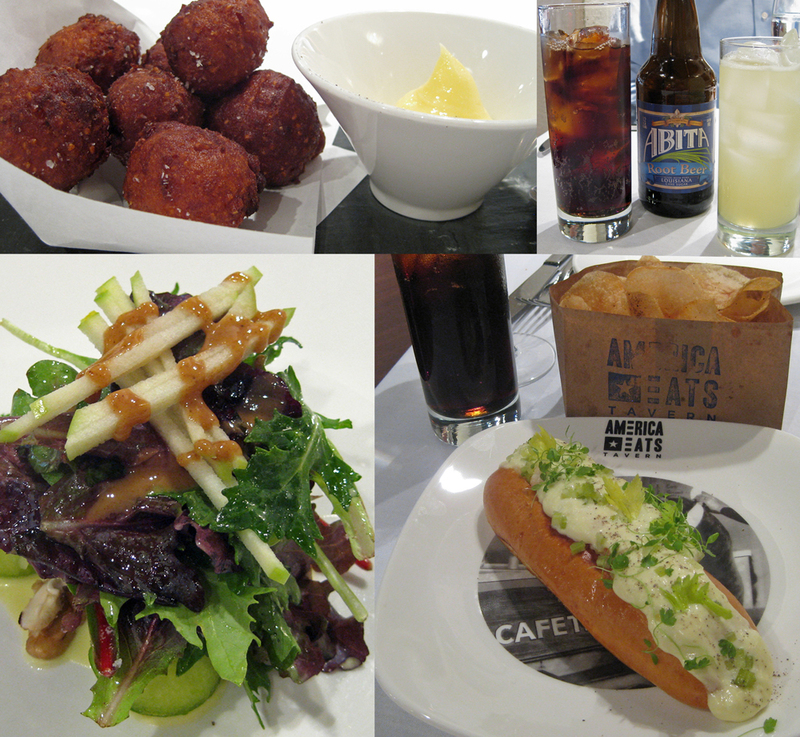 Day One, Lunch: Hush puppies, root beer & ginger ale, Waldorf salad, and Maine lobster roll with housemade potato chips. We liked the menu so much, we ate at America Eats Tavern twice over a long weekend. In round one, we kicked things off with Hush Puppies with homemade sorghum butter. Sorghum is generically sweet – sweeter than molasses and less minerally. The staple grain is refined to produce sweet syrup. We live in California and grew up in the Mountain West and we don’t know from sorghum, so this was an interesting treat. A damn good crab cake. Waldorf Salad, adapted from Oscar Tschirky’s 1893 creation, followed and while tasty, we thought it would have been better made with crisper, sweeter apples and celery, or at least celery leaves, instead of just an “essence” of celery. Sometimes the whole molecular cooking thing needs to be pared back a bit. This is one of those cases. 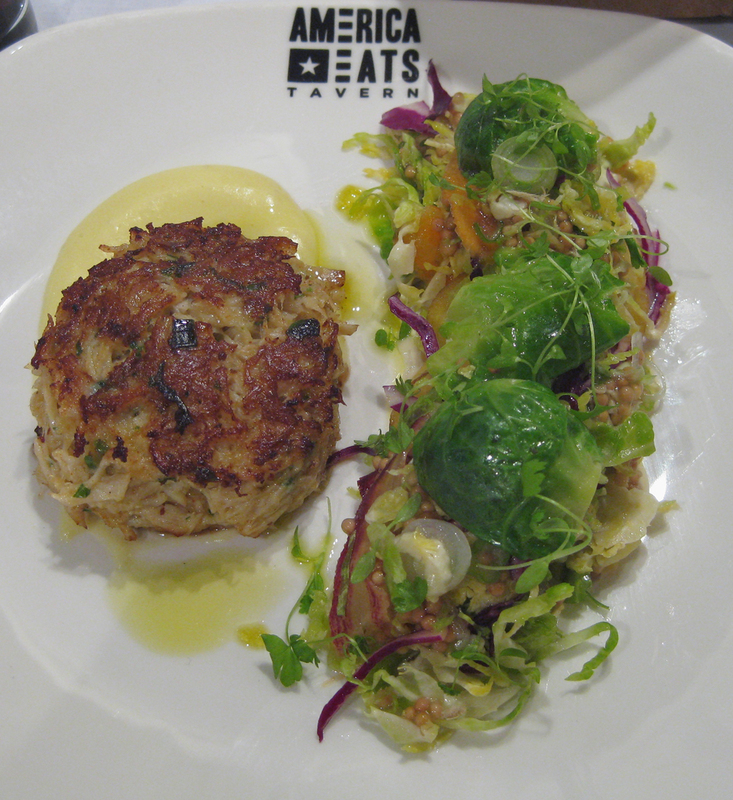 Chesapeake Crab Cakes were close to perfection with their toasty crust and pure crabmeat composition. We’re used to Dungeness crab in San Francisco but we thoroughly enjoyed the blue crab from the East Coast. The cake wasn’t gloopy with mayonnaise, it was just meat with a little seasoning. The way it should be. We shared a single generously portioned cake, but the glutton in each of us could have downed a whole one. They were very good. And that Maine Lobster Roll! Let’s just say that while rich and satisfying, we could have eaten another and not felt bad about it. Thank goodness for Mr. Rockefeller’s mistake in eating a bowl of soup relegated to the status of servant fair. What was once a food considered “demeaning,” lobster has become one of the great oceanic delicacies and we couldn’t be happier about it. Served with housemade potato chips, this was a dish that will haunt us for years to come. We washed all the savory stuff down with housemade ginger beer and Abita Root Beer from Louisiana. The meal ended with Pecan Pie, a tribute to George Washington’s love of the nut, and coffee with chicory a la Café du Monde (New Orleans). We returned for Sunday brunch to continue the trip through the restaurant’s Americana-inspired menu. 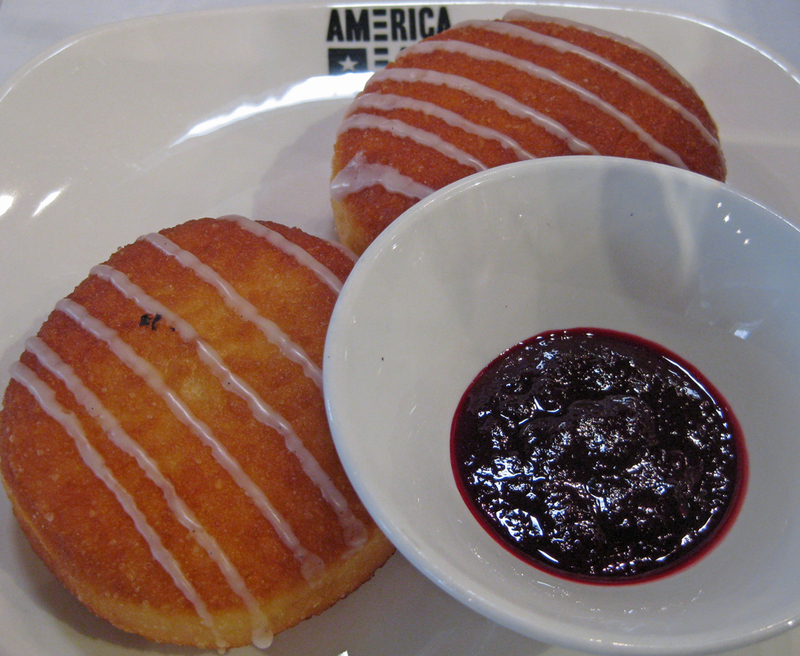 This time, we started with Homemade Donuts with Blackberry Jam. Light and not overly sweet, these donuts paired nicely with the tart jam. Next we dove into Vermicelli Prepared Like Pudding, an early American take on mac n’ cheese. We loved this surprising dish for its garlicy, buttery richness and the absence of soupy cream sauce. The accompanying intensely flavored mushrooms burst with big flavor. We were glad for the modest portion. If you haven’t eaten grits, you must. 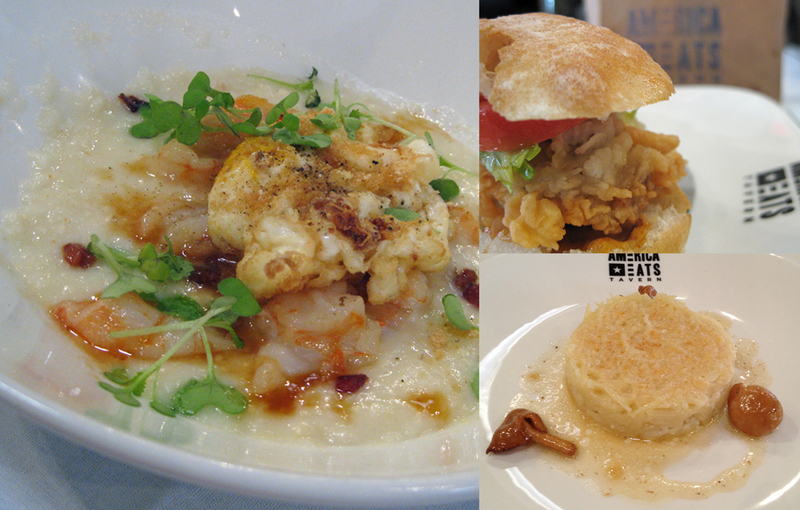 The Shrimp ‘N’ Anson Mills Grits with a Fried Egg pays homage to 1607 Jamestown. The grits, milled from heirloom corn, is a reminder of early Native American contributions to the colonists’ subsistence. These grits are creamy and not too sweet, setting a nice neutral palette for the fresh briny shrimp and smoky bacon. And that egg. It was poached alright – poached in olive oil. The result was nothing short of delicious with the crispy fried egg on the outside, creamy yolk on the inside! Brunch: Shrimp and grits, oyster po'boy, and vermicelli prepared like pudding. In keeping with the prior visit’s classic sandwich theme, we jumped at the chance to order the Oyster Po’Boy. The sandwich came filled with lightly battered, crispy on the outside, creamy on the inside oysters on a roll. Served with a little mayo, a tomato slice and a bit of lettuce, this New Orleans original was delicious. The oysters were fresh and sweet. The nicely seasoned batter held the mollusks together without overwhelming the delicate oyster meat. Even though we started the brunch with donuts, we also opted for dessert. This time, the kitchen’s take on Erma Rombauer’s (of Joy of Cooking fame) Pineapple Upside Down Cake. The pineapple puree-topped cake was accompanied by vanilla bean flecked Chantilly cream and Bachelor’s Button petals. The dish was both delicious and beautiful. This is a must try! The beverage offerings include nearly forgotten shrubs, squashes, phosphates and lactarts. Think vinegar and fruit juice with sparkling water, maybe some milk (lactart). These drinks are dry and clean and slight on sweetness. They provide a nice alternative to beer and wine as their subtle flavors tend not to compete with the flavors of the dishes they’re paired with. There's always room for desert. Pineapple upside down cake and pecan pie. 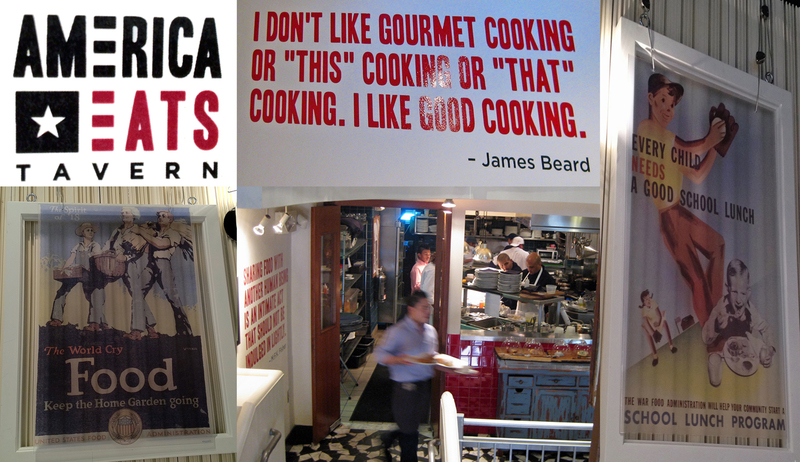 On both our visits to the restaurant we sat upstairs, surrounded by restored vintage posters and a James Beard saying. “I don’t like gourmet cooking or “this” cooking or “that” cooking. I like good cooking.” Jose Andres’ American rendition of classic favorites represents good cooking, but it would also be considered fancy cooking, sadly, in our day and age when portions are huge and fast food is abundant. “Typical” American food is now a far cry from what it once was. We’re grateful to Jose Andres for bringing back good American cooking and reminding us that American food is much more than a cheap hamburger and fries. If anyone needs a refresher on how great American cooking once was, and still can be, just sit back and enjoy this Spanish-American’s spin on vintage American cuisine. Viva Jose!